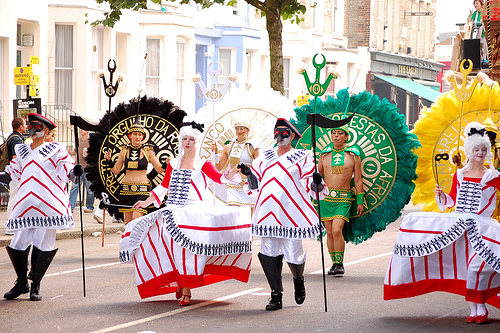 Since 1965, the west London neighbourhood of Notting Hill has been home to this event, which is based on the traditions of various Caribbean carnivals (especially Trinidad's), but has also been influenced by festivals and music from the many parts of the world to which today's Londoners trace their heritage. 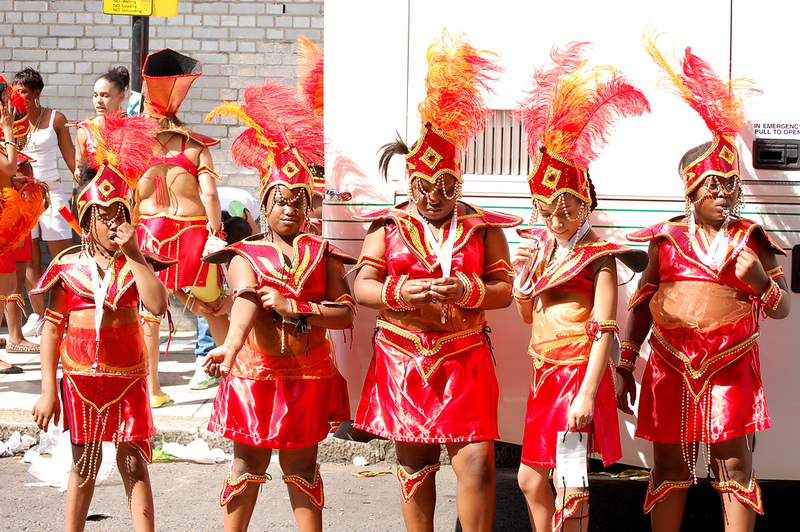 Costumed masqueraders dance along a three-mile parade route to the throb of music from sound systems and live bands, while hundreds of thousands look on, enjoying the spectacle and the food prepared by streetside vendors (looks like you can even get an ice-cold coconut). 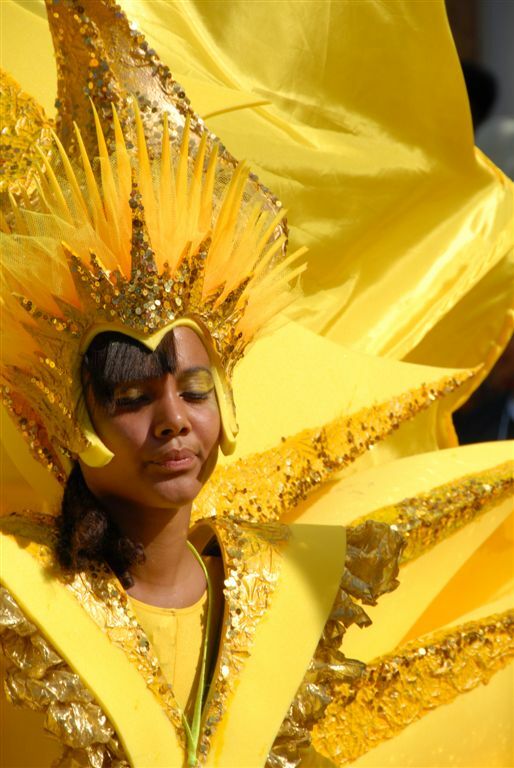 The carnival now extends over two days, with children's bands parading on the Sunday before the Bank Holiday and adults on the holiday itself. 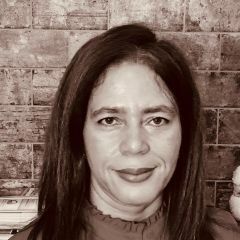 Meanwhile, hundreds of photographers, pros and amateurs, capture the colour and energy of the revelry, and some of them even post their images online where we can all enjoy them. 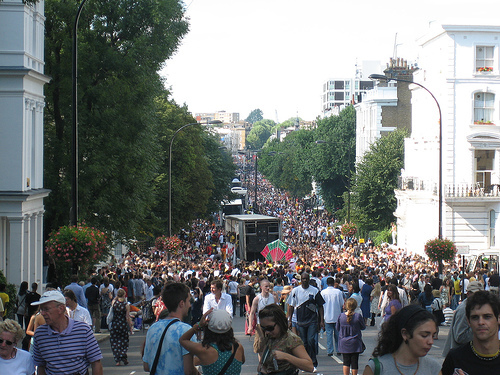 Here is a selection of photos from this year's Notting Hill Carnival posted on Flickr. 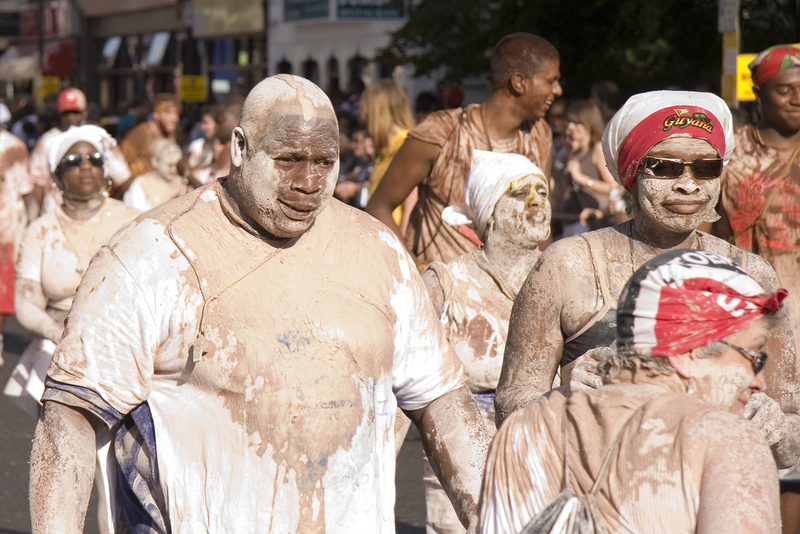 The Trinidadian influence may be strongest in Notting Hill Carnival, but the festival has always been celebrated by Londoners with roots in many other Caribbean territories. 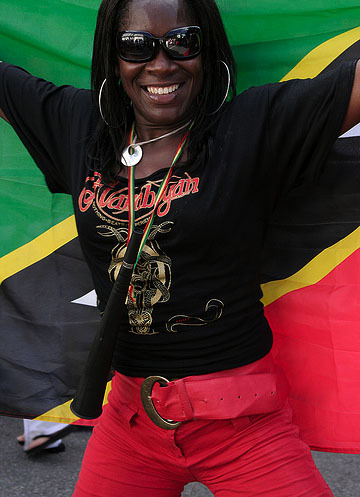 This woman dances with the national flag of St. Kitts and Nevis; Sunday 26 August, 2007. 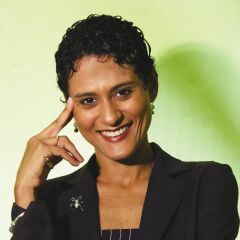 Photo by virgorama. 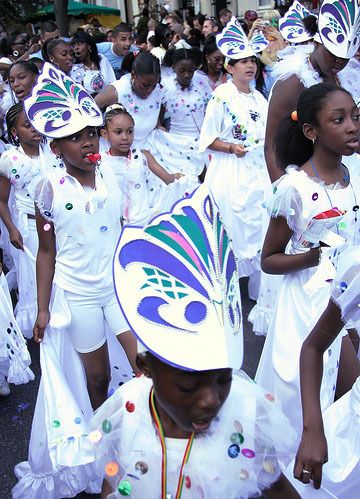 Masqueraders with the flags of other Caribbean countries: Guyanese, photographed by Tim Fearn; a Trinidadian woman, photographed by Cristiano Betta; a Grenadian, photographed by P*E*T*A.
Notting Hill Carnival was long known as a Caribbean festival, but today Londoners from many cultural backgrounds participate. 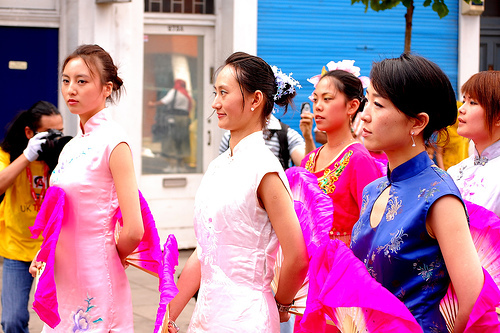 These dancers are costumed in Chinese dresses, complete with fans; Monday 27 August, 2007. Photo by Cristiano Betta. Those masks, those powdered wigs, those feathers? 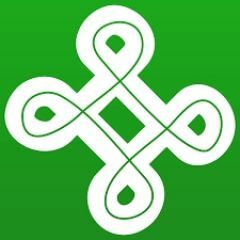 Venetian, Caribbean, Aztec? No, it's just Notting Hill; Monday 27 August, 2007. Photo by Cristiano Betta. 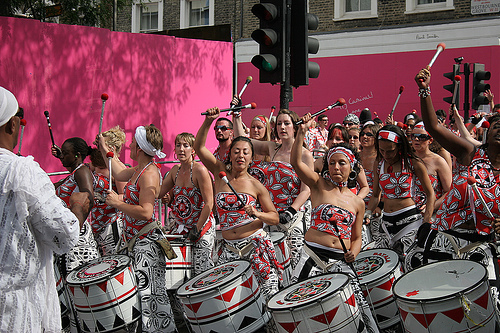 For more photos by these and other photographers, see Flickr's Notting Hill Carnival 2007 pool. Cool, nice that you liked my photos.